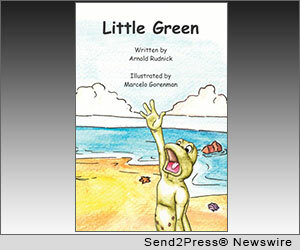 LOS ANGELES, Calif., Dec. 6, 2012 (SEND2PRESS NEWSWIRE) — Writer Arnold Rudnick and publisher Paraphrase, LLC, have donated 100 copies of new children’s book “Little Green” (ISBN: 9780981587974) to the My Stuff Bags Foundation and have pledged all net profits from book sales for the month of December 2012. “Little Green” is an entertaining new children’s book with an important message and question to consider: Isn’t it possible? Released in “Fraugust 2012” by independent publisher Paraphrase, LLC, “Little Green” is a picture-book for 2-7 year olds written by Arnold Rudnick, with illustrations by Marcelo Gorenman, featuring a little green frog on a quest to be special. To help children consider “Isn’t it possible?” – and further a commitment to literacy – Rudnick and Paraphrase, LLC, have donated 100 copies of “Little Green” to My Stuff Bags Foundation for holiday gift bags for children rescued from abuse, neglect or abandonment. More than that, Paraphrase and Rudnick have pledged to donate net profits from all new copies of “Little Green” sold in the month of December 2012. The My Stuff Bags Foundation provides new belongings, comfort and hope to thousands of children each year who must be rescued from abuse, neglect and abandonment across the United States. By rallying widespread individual and corporate involvement through their unique “My Stuff Bags” program, the Foundation addresses the immediate physical and emotional needs of rescued children, and helps support the agencies caring for them. Visit the website at www.mystuffbags.org for more information. Paraphrase, LLC, is a boutique publishing company promoting literacy with a mission to create thought-provoking media that educates, entertains and inspires. Their motto is: Read a book, Read a mind(R). Visit the website at www.paraphrasellc.com for more information. Arnold Rudnick worked in feature film development and has written for many television shows. His first book, “ESPete: Sixth Grade Sense” (www.espete.com) won a silver medal in the Moonbeam Children’s Book Awards and Reader’s Favorite Awards. In addition to writing, he works in school administration. He and his wife and children live in Los Angeles, Calif. “Little Green” is Arnold’s first picture book. Marcelo Gorenman grew up in South America. He taught himself how to draw and was eventually accepted at the prestigious School of Visual Arts in New York City, and later the exclusive 3-D animation program at Sheridan College in Canada. Marcelo has worked in animation and illustration since 2002, in Europe, Canada and the USA. “Little Green” is Marcelo’s first picture book. For more information about the My Stuff Bags Foundation, please visit http://www.mystuffbags.org/ . Visit Paraphrase, LLC, on the web at http://www.paraphrasellc.com/ . Visit the website for “Little Green” at http://www.isntitpossible.com/ . NEWS SOURCE: Paraphrase LLC :: This press release was issued on behalf of the news source by Send2Press(R) Newswire, a service of Neotrope(R). View all current news at the Send2Press for Journalists Portal: http://Send2PressNewswire.com/ .